When designing your events we focus on the type of outcomes the organisations and the individuals concerned need – and work backwards from there. Whether it’s dealing with difficult strategic issues, complex organisational or policy changes, getting people’s views on a new research programme, solving persistent problems or formulating new approaches, we create events where everyone has the chance to air their views, contribute and be heard. We work in a focused way which produces identified outcomes. And we ensure that events are recorded in ways that are unambiguous and easy to refer to in the future. Focus groups and small workshops. 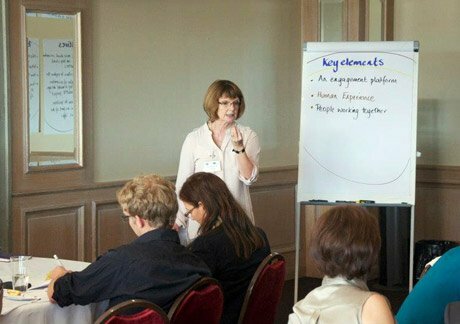 Our events are facilitated by expert facilitators working to the global competencies of the International Association of Facilitators. This means that they are independent and have a toolbox of techniques to help groups achieve the results they want. We design events which use the most appropriate techniques for your needs. This could be round-table discussions, building consensus in a large group, networked technology for voting opportunities or enabling participants to create metaphors which help them bypass barriers to realising a concept or task. We also use Open Space, World Cafe and other approaches that build buy-in from participants. Our facilitators are very experienced in handling situations where conflict could arise and working with people who are cynical or anxious about the process. We’re also very experienced at ensuring that everyone gets a chance to have their say – and that nobody hogs the discussions! We help you develop the right mix of face to face and virtual events.